Israeli warplanes struck a Syrian air defense base near the port city of Latakia on Thursday, US official have confirmed to media. An Obama administration official told AP that the attack happened overnight on Thursday, but provided no details. Another security official told the news agency that it took place in the Syrian port city of Latakia, and that the targets were Russian-made SA-125 missiles. Another US official told CNN that the Israelis believed the base near Snobar Jableh, south of Latakia, had sensitive and sophisticated missile equipment that may have been transferred to the Lebanese Shiite militant group Hezbollah. Earlier, Dubai-based broadcaster al-Arabiya reported two attacks carried out by the Israeli Air Forces – one in Latakia and the other one in Damascus. Neither the Syrian nor Israeli governments have commented on the alleged attacks. No casualties have been reported. A spokesman for the Israeli Defense Ministry declined to speak on the matter. “We’re not commenting on these reports,” he told Reuters. However, an Israeli official speaking anonymously to the news agency said he was inclined to believe that Israel had carried out a strike, although he was not entirely certain. 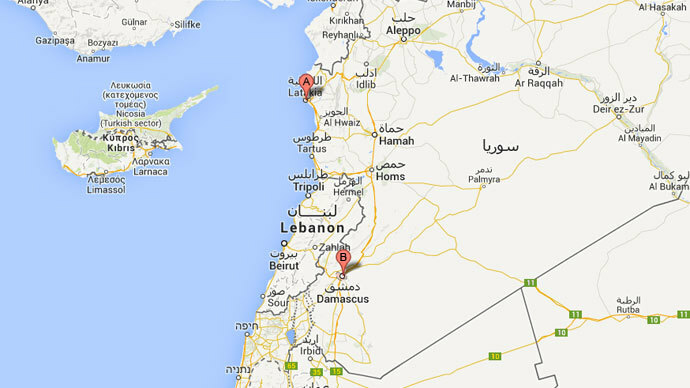 The Lebanese military said it observed six Israeli jets flying over Lebanese territory on Wednesday, Reuters reported. Israeli jets frequently fly over Lebanon, but such high numbers have in the past been an indication of a military strike against Syria. Earlier in the day, the Syrian Observatory for Human Rights (SOHR) said there was a series of explosions at a Syrian air defense base in the Mediterranean coastal province of Latakia. Meanwhile, a Syrian security source said that “a rocket fell near the base, causing a fire to break out,” AFP reported. However, RT Arabic’s source within the Syrian security forces has denied the media reports. There have been five previous incidents in which Israel is believed to have struck inside Syria. The first of those took place in January. In all of the alleged attacks, the reason given was that Israel feared that weapons were making their way into the hands of Hezbollah. But many critics said that it was just an excuse for a blatant direct attack inside Syria, RT’s Paula Slier explained. In the past, Damascus has threatened to strongly retaliate against such attacks. This entry was posted in +AAArchive, Israel, Israeli Crimes, Israeli Occupation Forces, Lattakia, Russia & Syria military, Russian Defense System, Terrorism By Proxy, Terrorist attack, Video, War Criminals, War on Syria, War strategy by syrianetwork. Bookmark the permalink. The Israeli’s just love to bomb anyone. How would the world feel if Russia were to start bombing U.S. missiles located in Eastern European countries? It’s the same concept. Israel gets away with anything. What precedent is there for the creation of Israel? How is it accepted by the world? The entire concept is repugnant. What’s must contradictory is the fact that the Zionist cause is based on biblical concepts. Religious ideology is the basis for Zionism, yet the primary zionists throughout history have all secular. Why does the world accept one religious groups interpretation of their own religious texts as a legitimate basis for invading, conquering, and occupying another people’s land?